Queens, NY, to Manhattan, with mile markers shown along the route. Don't be fooled by the name of this first one: Runtastic. Yes, it's an app for tracking runs, but it also works for logging bicycle rides, walks, hikes, and even inline skating (if you're into that, which I hear people are these days). In fact, most runners' apps have these capabilities. In other words, you don't need to buy or download an app that's specific to cycling or walking. These apps almost always have an option for you to pick your sport or leisure activity of choice. A couple of times, I used Runtastic just to map in real time a long dog walk and see how far is it and how much does my little pooch actually slow me down. If you wear headphones and listen to music while using Runtastic, the app can hook into your song collection so that you can set a "power song," or an up tempo song to play immediately if you feel like you're slumping. 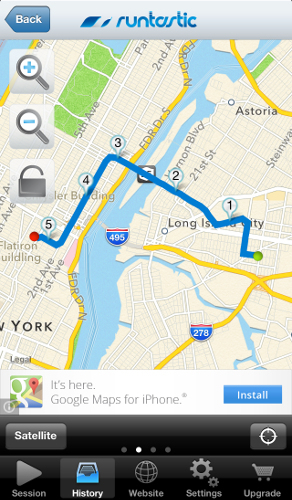 The app will also announce (if you turn on this setting) each mile as you complete it, like this: "Distance: one mile. Time: 15 minutes, 30 seconds." Full review coming soon. Untappd is an app where you track beers that you drink and connect with friends or other beer community members to see what they're drinking and whether they like it. This app is a tough one to discuss because while it's clearly one of the best beer apps available due to its strong community, the app itself needs a lot of work. Features you'd expect to be included aren't (there are so many I'm not going to start recounting them here), and the design of some backend processes seems poor to the point that it slows down the app from functioning smoothly. The search function deserves some development love as well. But again, it is one of the best beer apps you'll find regardless. Full review of Untappd coming soon as well. Often, after I review an app for work, I delete it. But since publishing a review of EasilyDo about a week ago, I still haven't wiped this productivity app from my phone. EasilyDo is something like a "smart assistant," at least that's how the CEO of the company that makes the app described it to me. I think of it more like an app that automates simple tasks; for example, if I get an email from a new person, EasilyDo offers to add that person to my Contacts. If EasilyDo spots an upcoming birthday of a friend on Facebook, the app offers to post a "happy birthday" message on my behalf. When I got this app, I expected I would use it all the time, but that's not how it has played out. Instead, I find myself checking in on the app every few days (rather than several times per day) to see if there's anything EasilyDo can automate that I forgot to do.